Domestic, Commercial, Industrial and Agricultural Electrical Work. With many years and vast experience as an electrician in Waterford & all around the Waterford & Kilkenny region, you can be sure that Tom Kearns Electrical Contractor will give you the highest quality of workmanship to every job. If you need a Waterford electrician or Kilkenny electrician we’ll be there. From the Design Stage throughout the electrical job to Certification we pride ourselves on providing a fast, efficient and reliable service. Whether its a large contract or just replacing a broken socket, every job is done with maximum effort and the minimum of fuss. 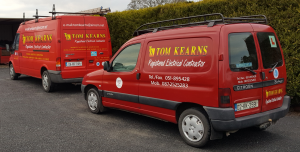 Tom Kearns Electrician Waterford serving the Waterford & Kilkenny regions.